The USS Enterprise is so famous that its registry number gets reused several times for successor ships (NCC-1701-A, B, C, D, E, etc.). Does this ever happen with any other Starfleet ships? Sisko's original USS Defiant (NX-74205) is replaced by another Defiant with a completely different registry number (NCC-75633), so apparently using letters to designate a replacement or successor ship is not a universal practice. Is the practice of using letters limited to the Enterprise, or are there other examples of this in any Federation era? This question is not really asking when (that is, under what criteria) a letter is chosen for a replacement ship and when a full renumbering is given, but if the Enterprise was uniquely qualified in some way to receive a letter while all other replacement ships were not (because reasons), that's an answer. The Federation Timeship USS Wells (NCV-474438-A) has a suffix designation, as seen in Star Trek Online. In the TNG episode "Where Silence Has Lease" the Galaxy class Enterprise NCC-1701-D encountered what seemed to be a sister ship the Galaxy class Yamato NCC-1305-E, but it turned out to be a fake ship created by the strange alien being Nagilum. In the TNG episode "The Measure of a Man" an Okudagram said, that the Galaxy class Yamato NCC-24383, commanded by Captain Richard Mackenzie was patrolling the Neutral Zone in sector 134. In the TNG episode "Contagion" the Galaxy class Enterprise NCC-1701-D encountered the real Galaxy class Yamato NCC-71807 under the command of Captain Donald Varley. A piece of hull from the exploding Yamato has 71806, but dialog in the episode establishes that the registry number is NCC-71807. Thus we see that the USS Yamato also had a registry number with a letter suffix. Why did the Yamato also have other registry numbers? Maybe in the era of TNG some starships have two or more registry numbers at the same time, or maybe Starfleet kept changing the registry number of the Yamato for some reason. In real life, this was the result of various errors and failures to communicate by the production staff of TNG. But in the universe of Star Trek each of the Yamato's registry numbers is correct and valid. 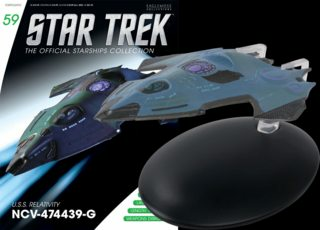 In the era when TNG was produced, physical models of starships would keep their hull markings as long as they lasted, or until someone physically repainted them. And computer graphic models of starships would also keep their hull markings until somebody reprogrammed them to show different hull markings. So a specific starship would have the same registry model on its hull every time it was shown. But how do we account for the different registry numbers of the Yamato in the fictional universe of Star Trek, since each number is as canonical and correct as the others? With the technology of almost 400 years in the future, it is easy to believe that it would be trivaly easy to program different parts of a starship hull to show different colors and thus to rewrite its registry numbers. Thus if Starfleet kept changing the registry number of the Yamato the hull would keep changing its pattern to show the new registry number. And if the Yamato had several different registry numbers at the same time the ship could be programmed to cycle between numbers on the hull, switching at regular intervals. And since the ship could be programmed to display different registry numbers on the hull, the Iconian invasive program that was interfering with the ship's computer programming could have cause the number on the hull to change from 71807 to the inaccurate 71806 before the Yamato exploded. And maybe the Enterprise also has two or more registry numbers, and its hull markings may display each on in turn in a regular cycle, but we only get to see one of those registry numbers, NCC-1701-D. The limitation to answering this seems to be excluding books. There was a "Yamato A" in book form. In the actual medium of film/TV it was not used as I recall. In the star trek technical manuals(which are deemed canon) there are numerous and varied ship designations dependent on form & function. A designation of any ship ending with an X to indicate an experimental ship. Legacy ships designated by alphabet - currently the enterprise is, in variants, as far along as J. The crash of the D where Riker mourns his loss of chance to 'sit in the captains chair' and Picard confidently replies that this won't be the last ship named "Enterprise'. The technical manuals are many and varied - I could post walls of text drowning in details - here is the SPECIFIC reference to the Yamato A; there are many, many others - if one cares to 'dig them out' from the voluminous reference works. These ARE canon, used by filmmakers, writers and game makers. Star Trek Online is a prime example of meticulous attention to detail. Examine the 'guidelines' for any attempt to have a star trek novel published and you run up against the Canon regulations - from the technical manuals. Not the answer you're looking for? Browse other questions tagged star-trek names or ask your own question. Are there any other ships that have an alphabetical suffix? Why does the USS Enterprise always have the same registry number? Did the Federation have any large starbases orbiting other planets?